Do you mind if I toot my horn just a wee bit? I'm just so excited! 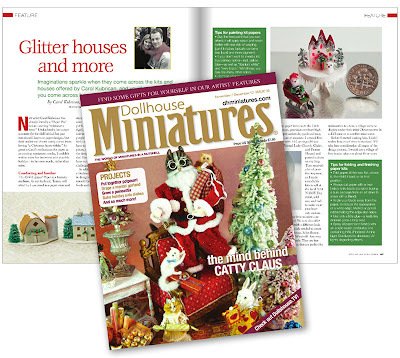 The November/December issue of Dollhouse Miniatures magazine contains a feature about True2Scale, compiled by Janet Stuart. It is the first time we've been featured in a magazine (blush)! 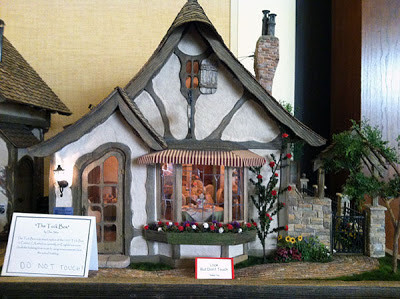 I think a copy of the magazine will make a fun gift for my mother, who ignited my passion for miniatures when I was a child. I'm looking forward to seeing her expression when she opens the magazine! The cover showcases Bridget McCarty's charming animals. 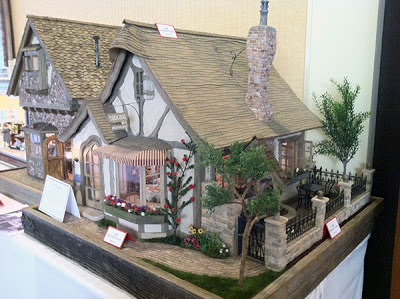 The Good Sam Showcase of Miniatures in San Jose, California, was so much fun! Mr. T2S and I enjoyed meeting many new people, including Patty from Petit Orphelin. 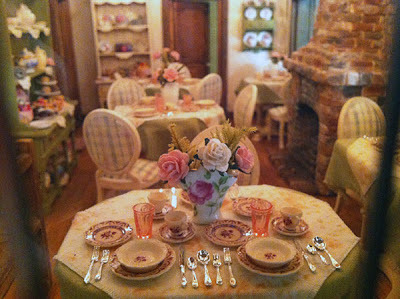 She shared a couple of her sweet, hand sculpted babies with us. On Sunday morning, I demonstrated applying decals to dishes. In the afternoon, I had time to view a few of the pieces on display from area miniaturists. One of those pieces, The Tuck Box, was built by Don Silva. Don took measurements and photos of the life-size Tuck Box in Carmel, California and built an exact replica of the 1927 English style tea room. 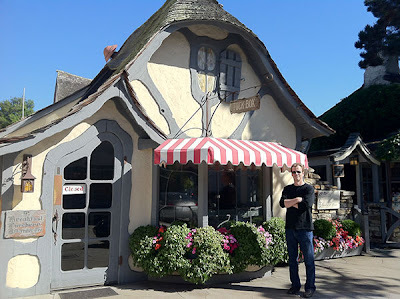 It was so charming, that Mr. T2S and I decided to make a visit to Carmel the following day. Unfortunately, The Tuck Box closed just before we arrived, but we did enjoy checking out the neighboring gift shop and wine bar! The Tuck Box by Don Silva. Interior by Don Silva and Connie Suave. Do you recognize the dishes pattern? The real Tuck Box in Carmel, CA.